So it’s been a while since I’ve shared a recipe here! I’ve been working on some things, and I think you’ll really like this recipe. It’s a great appetizer at a party, and reheats really well for lunch. It’s especially tasty with the green chili sauce, but be warned, it’s a little bit spicy! 1 tsp. chipotle powder (optional – this is a little extra spice). Cook the chorizo in a pan over medium heat, making sure to use a wooden spoon and break the meat up into as tiny pieces as possible. While you’re doing this, start working on the cornbread. Prepare according to package directions, but add an extra egg (this helps keep the whole thing together). 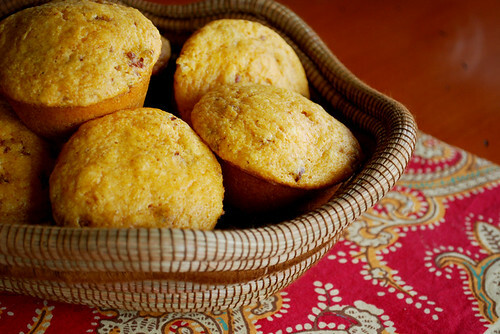 Mix cornbread mixture until barely moistened, and then stir in remaining ingredients gently. I like to put these into little bitty muffin tins to make them all the more bite-sized. Fill muffin tins 3.4 full, and then cook 10-20 minutes, depending on pan size. Pop out, and enjoy!! Combine all ingredients in a small saucepan, stirring frequently with a whisk. Cook over medium-low heat until the mixture has thickened and lost about half of it’s volume. It will seem really liquid when it’s warm but be warned, it will thicken when cooled. 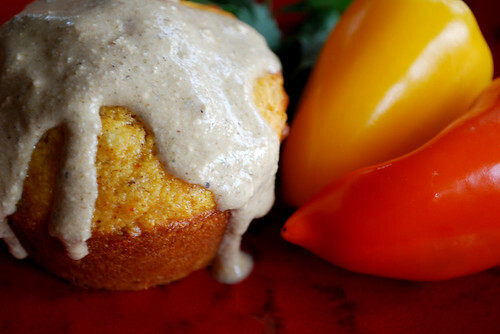 Serve over cornbread muffins, eggs, breakfast burritos, anything! First off, let me say, I love banana bread. I seem to make it a lot, usually because I have tons of overripe bananas lying around, as I’m a very picky eater and there’s about a 2 hour window in which I can actually eat a banana without gagging. However, sometimes there’s only one banana left. And what do you do in that situation? 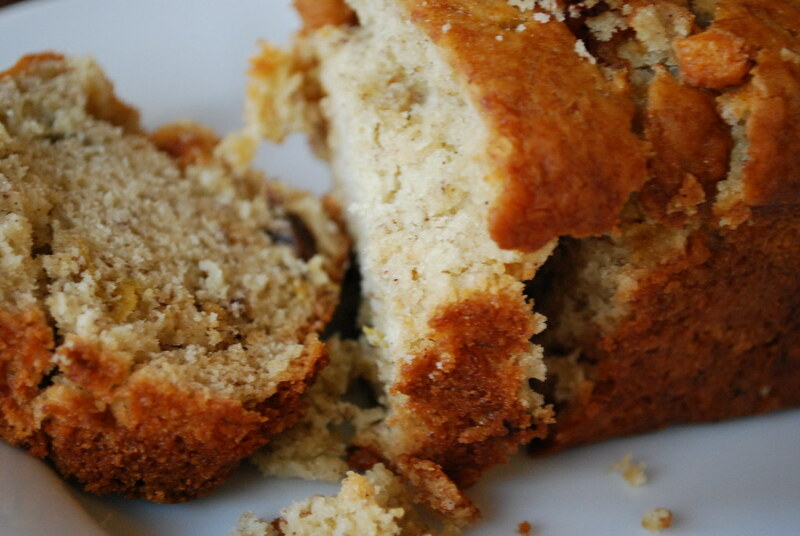 It’s not nearly enough to make banana bread, but you feel bad throwing it away. And there’s no way I would ever eat it. The solution? Banana-Pear Bread! I’ve always got some extra fruit lying around and pears seem to do the trick. nuts, raisins, or whatever else you might like chopped up in there. I like butterscotch chips but you could do chocolate too! Preheat oven to 350 degrees. Grease loaf pans (I usually use crisco and a big cheap paintbrush). In a large bowl, mix together eggs, bananas, sugar, cooking oil and vanilla. Beat until well mixed. In another bowl, mix flour, baking powder, baking soda, cinnamon, and a bit of salt. Add the egg mixture to the flour mixture and stir with a spatula until it’s well moistened but not too well mixed. Now is the time to add the delicious bits – chocolate chips, dried figs, raisins, cashews, whatever you like! Spoon batter into the loaf pans, filling about 2/3 of the way full (trust me, otherwise you’ve got a battered oven to deal with). Bake for 50 minutes or so. If you stick a toothpick into it, it should come out clean. Let cool on a wire rack, and then slice, slather with good salted organic butter and enjoy! I always associate meat pies with colonialism and all that that entails. Afternoon tea, the spice trade, meat pies wrapped up in paper at the local corner bakery. Sadly, they’re really hard to find in the US and I think that’s a shame. So I came up with a recipe that tastes like my favorite Aussie Meat Pie, but I think the most fun about this is adding ingredients to fit your tastes. Curry, ketchup, hot sauce…the choices are endless. Same goes for the meat – I think that this would be really delicious with lamb. Cut butter or shortening into the flour with two knives or a pastry cutter. I like to do half and half so it’s especially buttery and flaky. Add milk slowly while stirring – just enough to make soft dough. When dough is soft, knead a little bit and roll out, filling pan. Save a little bit for the top crust. Brown onions in a pan over medium heat – add ground beef and cook thoroughly. Add remaining ingredients, mixing thoroughly. Add the flower a little bit at a time so it doesn’t clump. When beef is thoroughly mixed, transfer to lined pie pan and use remaining crust to cover the top, cutting a few slits for ventilation. Bake at 375 until crust is golden brown. Serve and enjoy! I used a bitty little pan for mine – about 6″ across and kind of tall. You’ll have to see what works best for you! 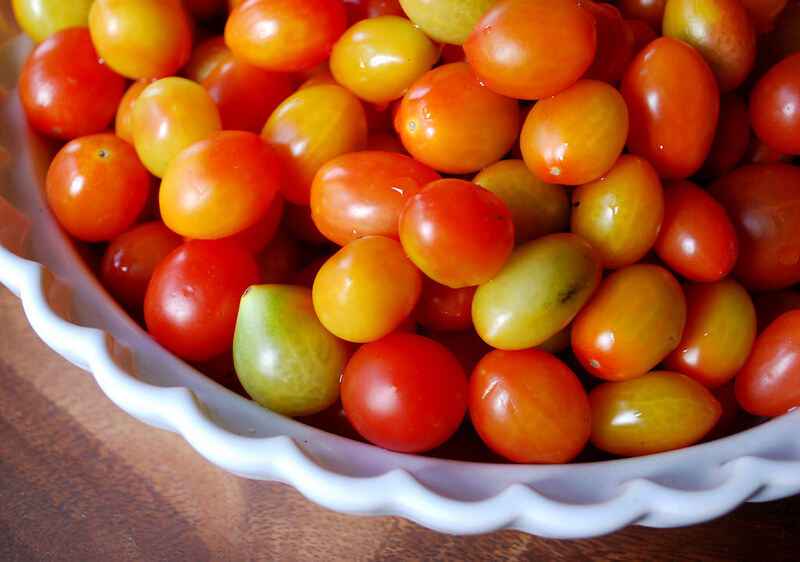 At the flea market a few weeks ago, I stumbled upon a great deal – 20lbs of freshly picked grape tomatoes for $5. I love tomatoes, but I love a deal even more, so I dutifully lugged them home and was presented with an enormous problem – what on earth do you do with 20lbs of grape tomatoes? I froze a lot of them (which really works well – you get little tiny tomato ice cubes) but still a ton remained. I got some recipes from friends that I have yet to try out but that I’m really excited about. My main focus was on preservation, and finding a way to store them that would work well in the freezer and be pretty versatile so I could use them on everything and thus use them up. I’m going to experminent later with some of the recipes that I recieved but I’d like to share a few of the ones that I came up with. They’re just sauces, but they provide a great burst of flavor for just about any meal. You can find them here, in my recipe section. I hope you like them – I really did! If you’ve got a delicious recipe that you’d like to share, please let me know at thecraftbegins@gmail.com! Interview additions and a new recipe! The lovely Ms. Teske set a follow up yesterday to her interview. She had demurred from answering one of the que stions, saying that too many crazy things had happened to her (!) but she came up with a story, and I think it was a good one! Her story follows below. 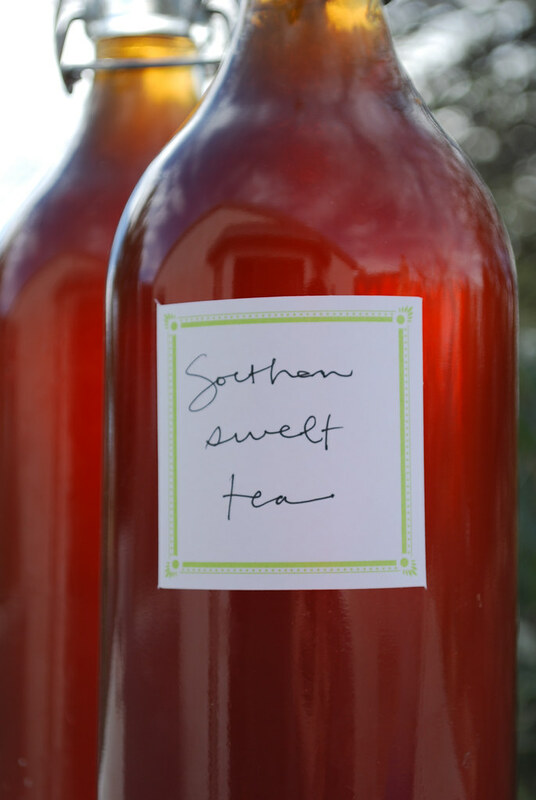 Also, in the meantime, there’s a new recipe for Southern-style sweet tea that you can find here. It’s starting to get warm here in Arizona and I’m dreaming of summertime! This is the perfect refreshment for when it’s warm outside, or when you want to get start thinking about spring. “In 2002, while traveling in a VW bus in Australia, which they call Kombi vans, I may have had the craziest thing that has ever happened to me happen (although I had three other stories I could have told you….). I was traveling with Andre, my then boyfriend, now husband, and our friend, Dan. If it was not crazy enough to agree to live in a van for 8 weeks with, at times, stinky and annoying boys (although I was also both of these things at time) I had no idea what we were in for. After traveling up the east coast of Aus, over about 5 weeks, we decided to head into the Outback. Here kangaroos are EVERYWHERE (3 million kangaroos are killed LEGALLY in Australia each year by Roo hunters), and sometimes it is 250 km between towns on a one lane road. When cars meet they each have to put their two outside wheels off into the ditch, or get off the road completely when meeting a tractor trailer, which can be a “road-train” with three containers! Well, on one of these lovely roads, in the middle of no where, or actually specifically somewhere between Longreach and Jundah, a truck passed us, completely in the ditch, then came back in front of us, and as it got back on the road, it threw a giant rock into our “windscreen” (or as we say in North America, windshield). Now, in vehicles made today, it may have cracked it, or even shattered it, but it would have stayed intact… not so in a 1970 something VW van. The windshield literally shattered, in a million cracks we could not see out of and then stayed that way for about 5 seconds at which point blew into the van. Dan, who was driving, thankfully had “sunnies” (sunglasses) on, but had to pick bits of glass out of himself, and even though I was the furthest in the back I had to, too. We were now in between two towns with VERY LITTLE traffic…. and we had already been through Longreach (http://en.wikipedia.org/wiki/Longreach,_Queensland), gone to Jundah, had van trouble, changed spark plugs in a dirt lot in Jundah, headed back to Longreach to go to a garage, and were now headed back to Jundah to continue our trip. Since we knew there was not a garage in Jundah that could work on VWs, we knew we needed to go back to Longreach FOR A THIRD TIME. We drove something like 90 km, without a windshield, which is NOT a picnic, in fact, there is a good reason we have windshields. We had to drive really slow, and at one point we almost hit a calf which could have flipped up into the van… the sun went down during all of this… I was never happier to reach a destination. Long story short, and it is a long, funny, and agonizing story, we spent 8 days in Longreach… a windscreen needed to be sent from the coast, and they only make two types of windscreens, but we got the wrong one sent to us the first time, and needed to wait something like 6 days for the right one to arrive! In the meantime, we befriended most of the town. The first day we got there, no one would talk to the crazy hippies in the Kombi with surfboards strapped to the top, and no windscreen, in the middle of the Outback. But, by the end of the 8 days we had befriended the VW mechanic, all the kids who played in the local park, and most of their parents who hung out at the biker bar in town. I went to every little hole in the wall museum in this 4,300 person town. We had little money, but did spend one night in a motel so we could shower, eat take out pizza, and watch movies. Our last night, to top it all off, was also pretty crazy… we went to the biker bar to see a band called The Lees. The bar was crawling with locals, including little kids. And The Lees (http://www.thelees.com.au/bandHistory.php) turned out to be a family band much like The Partridge Family. Mom played bass, Dad played guitar, brother, about 14 played the drums, sister about 17 sang, sister about 12 sang, and sister about 7 sang, played, and worked the lights…. it was crazy, awesome, amazing, and when the oldest daughter sang Alanis Morissette, a fellow Canadian to the guys (I am from the states) we decided to started talking to them on a break and told them our sad story. They hung out with us into the night, and even gave us one of the rooms attached to the bar, which they were staying in as the featured band. The next day, they gave us their coordinates in the town of Broken Hill, along with an invite to come and visit AND our new windscreen arrived! It was Andre’s birthday, and Dan’s birthday the next day…. Happy birthday, guys! The mechanic installed the screen, we headed to Broken Hill, and stayed with the family band for 3 days before heading home to Canada. Steve and Tracey, and their 4 kids, Raechel, Jarod, Faith and Savannah, are still friends of ours, and have come to visit us in Canada. Nothing could quite be crazier…. So sorry, and special herb-infused oils! I’ve been running into some serious computer problems lately, but it looks like I’m back for a bit at least! So I’d like to share with you all a really, really easy recipe. I love fresh herbs in the summer, and buy way more than I could ever possibly consume. I dry a lot of them (upside down in a paper bag) which works like a charm, but I wanted to find another way that I could preserve those yummy summer flavors. So I settled on infused olive oils! I thought that it would be really difficult, and that it wouldn’t turn out, but they ended up being wonderful. Now the kind of oil you makes really depends on your tastes, but some of the ones I made were: blood orange; citrus (orange, lemon, and lime); herbs du provence (rosemary, thyme, garlic); lemon dill; and green meanie. Green meanie is the most delicious – every fresh herb I could find, including garlic, thyme, dill, rosemary, and basil. All you have to do is pick a flavor combination that you love (I made my mom some straight basil oil) and then find a clean, pretty bottle. Place the herbs in the bottle (the more the better, I say!) and then fill to the top with olive oil. Let it sit at least a week – the flavor will be nice and intense by then. It keeps indefinitely, or at least so it seems. And the best part is, when you use some of it you can just refill the bottle with more oil and that way it lasts forever! I like to use these oils as an easy salad dressing, as a marinade for chicken or fish, to dip bread it, and pretty much anything else you can think of that needs a bit of light herb flavor. Go crazy! Add peppers or flowers or anything you want. 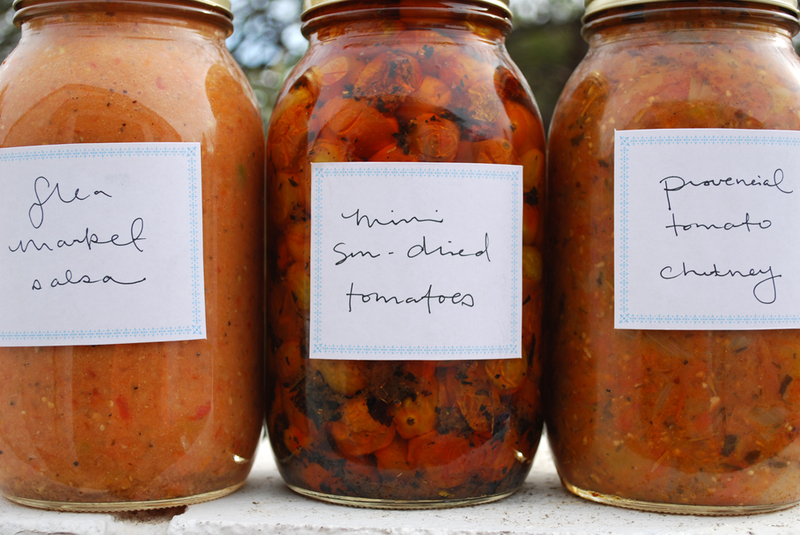 The possibilities are endless (and I use this in a lot of my recipes so it never hurts to have some on hand). Today the sun was shining and it was actually warm! It’s been pretty warm here for the last couple of weeks, on and off, but the wind always takes away from the heat. Luckily, no wind today! However, springtime and heat always makes me think of delicious, icy lemonade. It’s hard to find the good stuff anymore – all you get is that pre-made stuff that tastes quite eerily similar to ammonia. But really, who has the time to squeeze all of those lemons? I might, but I think that I’d rather be spending my time doing something else. So, I came up with a way to make easy lemonade that tastes even better than it looks! Slice the lemons in thin slices (this is mostly to make it look good). Add water, brown sugar, and lemon juice and mix well. The brown sugar gives it a more complex flavor than typical cane sugar would. Serve over ice, and garnish with some basil or rosemary if you want to get crazy!